I have never been sure just how to wear “Wedge Heels”. I tend to look down and see a chunky foot in a shoe that I really like. I know these are best when you need to walk over grass – think outdoor wedding and when you want the leg-elongating effects of high heels and not stilettos. So I found this discussion on wedge heels. It helped me. When wearing wedges with skirts, steer clear of anything too form fitting. Wedges can appear quite chunky, and teaming them with a pencil skirt or anything, body contouring can give an unflattering and ‘clunky’ appearance. Fuller, flowing skirts ultimately look better with wedge shoes. When it comes to how to wear wedge shoes, jeans are a classic option. However, it’s important to take note of the style of your jeans. Skinny jeans are perfect for showing off your wedges, but if you’re wearing bootleg or flared jeans make sure that the hem covers most of the wedge as this will create the most streamlined silhouette. 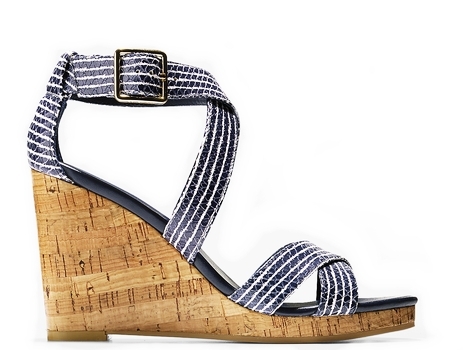 Work a playful look during the summer months with wedge sandals or espadrilles. Open toed and strappy styles are perfect for letting your feet breathe. There are a myriad of options for how to wear wedges this way, as they look great with everything from summer dresses to preppy shorts. In winter, try wearing your wedges in boot form. A knee-high boot with a wedge heel can give your outfit the extra edge. Wear them over tights and with a shift dress and layered knits for a cool off-duty look. If you’re looking to wear wedges to work, stick to classic pump style shoes. When looking at how to wear wedges to work, look for a mid-heel shoe with an enclosed almond-toe. A black leather wedge shoe is a great versatile option. Patent finishes are also ideal for creating a polished, sophisticated finish. Wedge shoes can be quite commanding, so it’s important to create a sense of balance. If a shoe seems particularly chunky, tone it down with softer fabrics and silhouettes. If a shoe lies at the ‘neutral’ end of the spectrum, then you’re freer to wear them with a brighter and busier outfit. When it comes to how to wear wedge shoes, experiment with different looks. This is one of the only ways to really find out what really works for you. Try on different outfit combinations to see what looks work best. If you want to know how to wear wedges, just remember that the key is in getting the right balance in your outfit. Floaty skirts and flared jeans are my picks for wearing with wedges. What are your best tips when it comes to how to wear wedge shoes?